Purjoi Nail Studio’s gel-polish line of 50 colors is infused with rich hues and has a high-shine gloss that can last up to two weeks. Here, Purjoi demonstrates how to achieve stacked 3-D nail art with Purjoi One Step Gel Polish in Orange You Fine. 1. Shape, buff, and cleanse the nail plate with alcohol or apply a nail prep dehydrator. 2. Apply two even coats of Purjoi Nail Studio One Step Gel Polish. Don’t forget to polish the free edge to ensure a proper application and wear. Cure time for each color coat is 60 seconds for LED and two minutes for UV. 3. Using your favorite nail art brush, apply one layer of desired 3-D nail art. Thin even lines are recommended in order to build height for the first layer. The first layer will act as an outline for your 3-D design, which will become higher as you apply each layer. Cure with an LED light for 90 seconds or a UV light for two minutes. 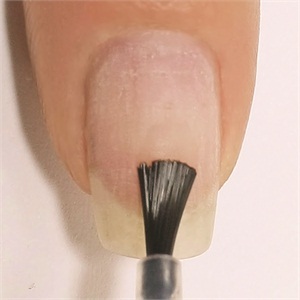 The curing times are a little longer for 3-D nail art, due to the thickness of the gel. 4. By tracing your first layer, apply an additional layer of Purjoi Nail Studio One Step Gel Polish. Depending on the desired height, you may want to add a third layer of gel-polish. Cure with an LED light for 90 seconds or a UV light for 180 seconds. 5. This step is optional and not necessary. However, depending on the 3-D art and the height, you may want to add a little protection. Apply a very thin coat of Purjoi Nail Studio High Gloss Top Coat. Do not apply the top coat too thick, as this may diminish the 3-D effect. The top coat will provide protection for your 3-D art and also provide additional shine. Cure top coat with an LED light for 90 seconds or a UV light for 180 seconds. 6. Finish the look with your favorite cuticle oil. To see the step-by-step in action, visit www.nailsmag.com/purjoigel.